To the lady who is most respected in Christ and the sister loved more than all other human beings, Agnes, sister of the illustrious king of Bohemia, but now the sister and spouse of the Most High King of heaven: Clare, the most lowly and unworthy handmaid of Christ and servant of the Poor Ladies, wishes you the joys of redemption in the Author of salvation (Heb 2:10) and every good thing that can be desired. I am filled with such joys at your well-being, happiness, and marvellous progress through which, I understand, you have advanced in the course you have undertaken to win the prize of heaven (cf. Phil 3:14). And I sigh with such happiness in the Lord because I know you see that you make up wonderfully what is lacking both in me and the other sisters in following the footprints of the poor and humble Jesus Christ. I can rejoice truly – and no one can rob me of such joy – because I now possess what under heaven I have desired. For I see that, helped by a special gift of wisdom from the mouth of God Himself and in an awe-inspiring and unexpected way, you have brought to ruin the subtleties of our crafty enemy and the pride that destroys human nature and the vanity that infatuates human hearts. I see too, that by humility, the virtue of faith, and the strong arms of poverty, you have taken hold of that incomparable treasure hidden in the field of the world and in the hearts of men (cf Mt 13:44), with which you have purchased that field of Him by whom all things are made from nothing. And, to use the words of the Apostle himself in their proper sense, I consider you as a co-worker of God Himself (cf. 1 Cor 3:9; Rm 16:3) and a support of the weak members of His ineffable Body. Who is there, then, who would not encourage me to rejoice over such marvellous joys? Therefore, dearly beloved, may you too always rejoice in the Lord (Phil 4:4). And may neither bitterness nor a cloud of sadness overwhelm you, O dearly beloved Lady in Christ, joy of the angels and crown of your sisters! Since you have cast aside all those things which, in this deceitful and turbulent world, ensnare their blind lovers, love Him totally who gave Himself totally for your love. His beauty the sun and moon admire; and of His gifts there is no limit in abundance, preciousness, and magnitude. I am speaking of Him, who is the Son of the Most High, whom the Virgin brought to birth and remained a virgin after His birth. Cling to His most sweet Mother who carried a Son whom the heavens could not contain; and yet she carried Him in the little enclosure of her holy womb and held Him on her virginal lap. Who would not dread the treacheries of the enemy of mankind, who, through the arrogance of momentary and deceptive glories, attempts to reduce to nothing that which is greater than heaven itself? Indeed, is it not clear that the soul of the faithful person, the most worthy of all creatures because of the grace of God, is greater than heaven itself? For the heavens with the rest of creation cannot contain their Creator. Only the faithful soul is His dwelling place and His throne, and this is possible only through the charity which the wicked do not have. He who is the Truth has said: Whoever loves me will be loved by my Father, and I too will love him, and we shall come to him and make our dwelling place with him (Jn 14:21). Therefore, as the glorious Virgin of virgins carried Christ materially in her body, you, too, by following in His footprints (cf. 1 Pet 2:21), especially those of poverty and humility, can, without any doubt, always carry Him spiritually in your chaste and virginal body. And you will hold Him by whom you and all things are held together (cf. Wis 1:7; Col 1:17), thus possessing that which, in comparison with the other transitory possessions of this world, you will possess more securely. How many kings and queens of this world let themselves be deceived! For, even though their pride may reach the skies and their heads through the clouds, in the end they are as forgotten as a dung-heap! 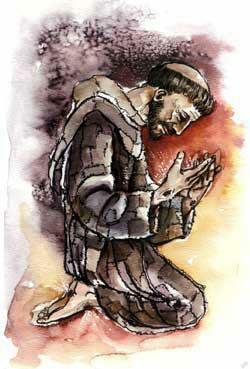 Now concerning those matters which you have asked me to clarify for you: Which are the specific feasts our most glorious Father Saint Francis urged us to celebrate in a special way by a change of food, feasts of which, I believe, you already have some knowledge – I propose to respond to your love. Your prudence should know then that, except for the weak and the sick, for whom Saint Francis advised and admonished us to show every possible care in matters of food, none of us who are healthy and strong should eat anything other than Lenten fare, either on ferial days or on feast days. Thus, we must fast every day except Sundays and the Nativity of the Lord, on which days we may have two meals. And on ordinary Thursdays everyone may do as she wishes, so that she who does not wish to fast is not obliged. However, we who are well should fast every day except on Sundays and on Christmas. During the entire Easter week, as the writing of Saint Francis tells us, and on the feasts of the Blessed Mary and of the holy Apostles, we are not obliged to fast, unless these feasts occur on a Friday. And, as I have already said, we who are well and strong always eat Lenten fare. But our flesh is not bronze nor is our strength that of stone (Jb 6:12). No, we are frail and inclined to every bodily weakness! I beg you, therefore, dearly beloved, to refrain wisely and prudently from an indiscreet and impossible austerity in the fasting that I know you have undertaken. And I beg you in the Lord to praise the Lord by your very life, to offer to the Lord your reasonable service (Rm 12:1), and your sacrifice always seasoned with salt (Lev 2:13). May you do well in the Lord, as I hope I myself do. And remember me and my sisters in your prayers.